The following content is created in consultation with Visit Seattle. It does not reflect the work or opinions of NBC BAY AREA's editorial staff. To learn more about Seattle, go to VisitSeattle.org. When it comes to food and wine, Washington State is uniquely blessed. From shellfish farms to orchards to a geologically rich and diverse terroir with 40 different grape varieties, this is a land that seems tailor-made for oenophiles and foodies alike. And then, of course, there’s Seattle, a city that’s home to a melting pot of cultures and a vibrant mix of innovative yet unfussy restaurants. With all this going for it, is it any wonder why the press have been quick to label the Emerald City America’s next great food and wine destination? That’s why we love Taste Washington. Taking place from March 22-25, the annual event is the nation’s largest single-region wine and food event, bringing together over 230 wineries, 65 restaurants and 60 culinary exhibitors from across Washington for the ultimate four-day experience. There will be parties, tastings, tours, pairings, seminars and celebrity chefs giving cooking demos on stage. Trust us, you won’t want to miss it. But with so much packed into four days, how do you best enjoy all that’s on offer? Of course there’s no wrong way to experience Taste Washington, but to help you celebrate the 21st edition of the annual event, we put together 21 flavors (plus things to see and do) that you won’t want to miss this year. Kick the long weekend off in style at Thursday night’s Red & White Party, where top Washington winemakers like Quilceda Creek Vintners will be pouring only their most coveted bottles. Held at Chef Wesley Hood’s luxe waterfront eatery AQUA by El Gaucho, you can nosh on an exqusite menu, mingle with VIPs, and sip exclusive bottles yet to be sampled anywhere else at Taste Washington. Speaking of intimate foodie events, it doesn’t get much better—or authentic—than enjoying an exclusive meal with a chef, winemaker and farmer. See and sample the local Pacific Northwest bounty at Taste Washington On the Farm. Starting at 10 a.m. on Friday, March 23, three different farm excursions will tour local farmers' properties alongside regional chefs and winemakers, then settle down for an indulgent lunch. Hey, it may not be summer yet, but that doesn’t mean you can’t enjoy a glass of rosé. 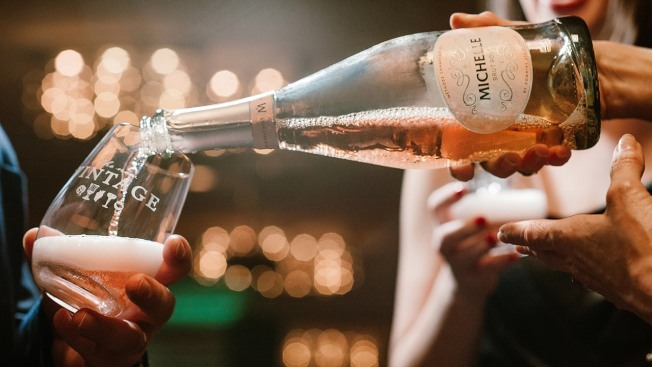 At Friday night’s The New Vintage party, you’ll not only have a chance to discover your new favorite wines while mingling with celebrity chefs, but you’ll also get to swing by the Rosé Lounge for a tasty glass of everyone’s favorite pink beverage. You know you’re noshing on the good stuff when it’s been prepared by avid runner and Jean-Georges alum Chef Gregory Gourdet. The mastermind and self-proclaimed health nut behind Departure restaurants in Portland, OR and Denver, CO, Gourdet will be on hand Friday night at The New Vintage, but will also take center stage at the Grand Tasting to serve his modern and flavorful Asian fare. Also taking the mainstage at the Grand Tasting (as well as making an appearance at Friday night’s The New Vintage) will be Sheldon Simeon, the man behind low-key but delicious Maui eatery Tin Roof. As friendly as he is innovative, this Top Chef: Seattle finalist is known for his adherence to local ingredients and his updated approach to classic dishes, not to mention his delicious poke bowls. Seattle’s chefs are decidedly different, which is one of the reasons we love them. And we love Chef Jeffrey Vance, a skateboarder and punk show enthusiast who transitioned to the kitchen. Today, the tatted chef helms two Seattle restaurants, the tiki-inspired Navy Strength and the James Beard nominated No Anchor. Catch him at The New Vintage Friday night at Fisher Pavilion. Brooke Williamson—winner of Top Chef season 14—has been crushing the SoCal culinary scene alongside her husband and co-conspirator. Williamson will be another headliner at the Grand Tasting on Saturday and Sunday, as well as a guest chef at The New Vintage, where she might serve anything from inspired gastropub bites to Hawaiian fare. Ok, so this vineyard might not be in an actual volcano, but Celilo Vineyard’s vines are located just below one. Take a deep dive on this celebrated Grand Cru on Saturday as experts walk you through its complexities and electrifying taste. Saturday and Sunday’s Grand Tasting is the main event, and there’s plenty — almost too much — wine and food to sample. Start with Walla Walla based winery Charles Smith Wines, whose irreverently named wines — like Kung Fu Girl Riesling and The Velvet Devil Merlot — reflect its eponymous vintner’s rock and roll roots. Pike Place Market is a Seattle icon and popular tourist destination. But what about getting your own private, early-morning food tour of the beloved landmark? With Saturday’s Taste & Savor Tour, you’ll be able to eat your way through the Market (make sure to nosh on the maple-bacon donuts), engage in one-on-one meetings with eight market vendors, and discover the icon’s best-kept secrets. Located in Seattle’s eastern suburbs, DeLille Cellars produces arguably the best Bordeaux west of, well, Bordeaux. In fact, we might even argue it ranks alongside the best French wines from that region. Judge for yourself at the Grand Tasting. Chances are you weren’t sneaking wine into the classroom back in high school, but the aptly named L’Ecole No. 41 has — in recent years — been producing some of America’s best reds (try the Semillon) in a 1915 schoolhouse turned winery. This one’s not to miss. From burgers to ramen, food visionary Chef Josh Henderson has always pulled from disparate influences to create his unique dishes. But at Sunday Brunch – a Turning Tables-inspired event taking place right before the Grand Tasting — he’ll be upping the ante. By collaborating with Chef Daniel Cox (whose pub grub restaurant Quality Athletics changed the sports bar game) and local folk-rock musician Kris Orlowski, the trio will be presenting an exclusive menu that’s sure to delight the palate as much as it does the ears. Inspired by a trip to Tuscany, Cured’s quality local meats are made in a former brewery in nearby Leavenworth. Sample their spice and salt-cured pancetta, or some of their German-style sausages. Pop by Fire & Vine Hospitality, where you can sample the fare of their impressive bevvy of restaurants. From Miller’s Guild, where James Beard Award-winning Chef Jason Wilson prepares rustic dishes like dry-aged beef and octopus carpaccio, to the pitch-perfect surf and turf of AQUA, this is one Grand Tasting space you won’t want to miss. With so much savory food on the menu, sometimes you can use a treat. Try the Sweet Iron Waffle Bar, whose proprietors will be serving up their delicious Belgian-style street waffles — organic brioche-style dough treats pressed to perfection and dusted with artisan pearl sugar. French-style wines are not the only thing on the menu. Local restaurant Taste of Provence will be slinging their tastiest French-inspired cuisine, like gooey Provençale quiche and crisp duck confit. What would wine be without cheese? Well, frankly, we don’t want to know. Luckily, local cheese makers, Cheeseland will be on hand at the Grand Tasting both Saturday and Sunday to make sure you get your fix. Try their aged Gouda, goat cheese or even Maasdammer, Holland’s milder answer to Swiss cheese. This being Seattle, we’d be remiss if we didn’t direct you to a raw bar. Look no further than the Red & White Party at AQUA by El Gaucho, where you can slurp back the bivalves of Taylor Shelfish Farms. For over 100 years and five generations, this family-owned business has been sustainably farming the waters of Puget Sound for the best shellfish the Pacific Northwest has to offer. It’s one thing to rub elbows with celebrity chefs, another to see these artists practice their well-honed craft. With a state-of-the-art kitchen built onto the Grand Tasting floor, and sponsored by Alaska Mileage Plan, you’ll have plenty of opportunities to catch these culinary masters whip up their signature dishes. Watch Top Chef alums and restaurant owners alike, from Mexican food masterminds Diego Galicia and Rico Torres (whose San Antonio eatery Mixtli features a gastronomic menu that’s equal parts historic and innovative) to Top Chef All-Stars winner Brooke Williamson. How can we forget the jewel of the event — the Emerald City itself! While Taste Washington will certainly be the focus of your stay, Seattle itself is not to be overlooked. With countless restaurants, craft cocktail bars, waterfront walks, lush parks, immersive museums and more, the city provides the perfect environment for your culinary getaway. To buy your tickets to Taste Washington 2018, visit tastewashington.org.